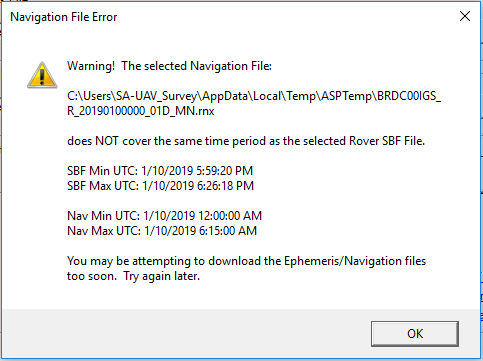 When auto-downloading the ephemeris and alternate navigation files, the alternate navigation file does not cover the same time period as the flight. This usually occurs soon after the flight, when the alternate navigation file has not been updated on the FTP site where this file is downloaded. It can also happen when the flight occurs across two GPS days (ex. January 10 @ 23:50 to January 11 @ 00:10). This entry was posted in AirGon Tools, Tips and Workflows and tagged navigation.